As one of the oldest conversion Mill properties in the southeast US, Whitehall Mill Lofts is unique and special property. The once cotton mill began in early 1800's, making fabrics and clothing well into the 1980's. Located on the North Oconee River, just 4 miles from downtown Athens and with shopping and restaurants just 2 miles away. The community offers several communal benches, table and chairs to take in the sights and sounds of the river. Many are memorized by the state park like beauty of the property and enjoy watching the blue herons, ducks, geese, otters, and terrapin in the river. The property offers several walking trails, perfect for your pet or just a lovely stroll! Unit #17 is right off the water, where the sounds of the never ending shoals soothes ones soul. Whitehall has only 5 courtyard lofts, and this is one of them. The deck has long river views and is covered with ample dry storage space below. The private deck is perfect for entertaining. 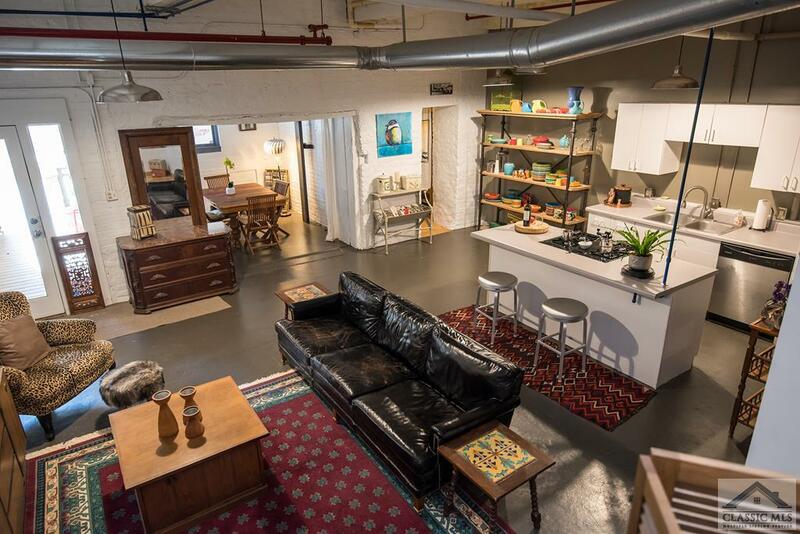 Once in the loft one can enjoy the open floor-plan with attached office/bedroom space created from the old elevator shaft with original I-beam arch hardware, kitchen that opens into the living room, dining room space, laundry room & flex space which can be made into a full bathroom. The upstairs bedroom has maple hardwood floors, a TV loft, and hobby nook. The bedroom has 3 windows each 6' tall with views of the hillside and landscape. It boasts a large walk-in closet and bathroom. Come see, and experience Whitehall for yourself. You won't regret it! *measurements and distances from owner. Whitehall Mill Lofts is a subdivision within the city of Athens, Georgia. There are currently 5 Homes for Sale within Whitehall Mill Lofts, with asking prices ranging from $225,000 to $592,000. The average list price per square foot of the available inventory in Whitehall Mill Lofts is $212, which is below the Athens average of $218. The Average Sales price of all sold real estate in this subdivision for the past year is $203,382. Recent comparable homes have been selling for 93.33% of their asking price. Waterfront homes represent 0.00% of the available Whitehall Mill Lofts inventory. The population of Athens, according to the 2010 Census, is 115,452. The total number of households in the zip code of Whitehall Mill Lofts is 15,949, with an average household size for of 2.27 people. The total number of renter households within the zip code of 30605 is 10,099, which means that 36.68% of households in this zipcode are owner occupant households. 585 White Circle #17, Athens GA 30605 is a Condo, with 2 bedrooms which is recently sold, it has 1,464 sqft, 0.0 - 0.25 sized lot, and None parking. A comparable Single Family Attached, has 2 bedrooms and 2 baths, it was built in and is located at 585 White Cir #31 Athens GA 30605 and for sale by its owner at $ 425,000. This home is located in the city of Athens , in zip code 30605, this Clarke County Single Family Attached, it is in the Whitehall Mill Lofts Subdivision, and Cedar Creek are nearby neighborhoods.